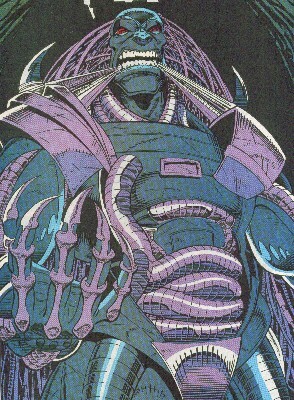 Powers/Abilities: Tyrant is extremely powerful, able to challenge even Galactus. He draws on power from the biospheres of planets in the universe; every planet that Galactus consumes leaves one less planet available to Tyrant. He has stood up to combined assaults from Beta Ray Bill, Ganymede, Gladiator, and the Jack of Hearts, and proven triumphant over them all. When not actively battling foes, Tyrant apparently occasionally enters a state of mecha-catalepsy, wherein he psionically links himself to the countless internal systems of his Fortress and/or Worldship. He commands a seemingly unlimited number of Heavy Troopers, an army of robots who have proven powerful enough to take out the likes of the Gladiator and Morg. In addition, his Fortress has equipment that can hold beings such as the above, and drain their energies to power his Troopers and his Fortress. In addition, Tyrant apparently commands large numbers of alien races he has conquered and enslaved, who work aboard his Fortress. Amongst these are the monstrous Dendurian Carnosaurs. (Cosmic Powers#6 (fb) / Silver Surfer III#107 (fb) - BTS) - In the universe's infancy, shortly after Galactus first felt the pangs of his great hunger (i.e. billions of years ago), the world-devourer constructed a being in his own image and gave it life. Galactus designed this being so that both creator and creation drew upon the same biospheric energy, allegedly to hold the creation in check. The creation was not content with his lot and grew jealous of his creator. Where Galactus was satisfied to survive, his creation wished to conquer, to rule. (Cosmic Powers#5 (fb) - BTS) - This creation, who would become known as Tyrant, became a conqueror, subjugating the worlds that would bend to him and destroying those who would not. (Silver Surfer III#82 (fb) - BTS) - According to Tyrant, he achieved a godlike status, with whole galaxies perishing at his whim, and he was feared by all beings. (Silver Surfer III#81 (fb) - BTS) - The Spinsterhood dedicated itself to opposing Galactus' creation, the near-omnipotent despot they called Tyrant, who had apparently built for himself an empire. Their war spanned centuries and galaxies. (Cosmic Powers#6 (fb) / Silver Surfer III#82 (fb) - BTS) - Galactus confronted Tyrant over his betrayal in attempting to wrest the universe from his grasp. After a devastating battle that laid waste to the galaxies around them and cost them both much, Galactus proved triumphant, reducing Tyrant to his current size and form. (Silver Surfer III#81 (fb) - BTS / 82 (fb) - BTS / Cosmic Powers#5 (fb) - BTS) - The Spinsterhood succeeded in repelling Tyrant and his armies, driving them into exile past the boundaries of known space. (Silver Surfer III#81 (fb) - BTS / 82 (fb) - BTS) - For ages, Tyrant waited in the "darkest corner of the universe," biding his time as he absorbed vast stores of energy, until he was strong enough to reclaim his empire. (Cosmic Powers Unlimited#3 (fb) - BTS) - Aboard Tyrant's prison-like "Worldship" (Fortress), Tyrant enslaved many conquered races to serve his needs and maintain this techno-organic globe. (Silver Surfer III#78 - BTS) - The Fortress, containing Tyrant and his Heavy Troopers approached known space, apparently for the first time in billions of years. (Silver Surfer III#79 - BTS) - Tyrant's Heavy Troopers incapacitated and captured Gladiator of the Imperial Guard when he investigated an anomalous power reading in uncharted space. Shortly thereafter, they encountered and subdued Beta Ray Bill, who had only just recovered from a beating at the hands of the maddened Thor. Both prisoners were taken to the Fortress. (Silver Surfer III#81 (fb) - BTS) - The Gladiator and Beta Ray Bill were placed in manacles that drained their power, adding it to Tyrant's stores. (Silver Surfer III#80 - BTS) - The return of Tyrant was detected by the sensors in the stasis chamber of Ganymede, last survivor of the Spinsterhood, and she awakened and prepared to battle against him once again. Meanwhile a group of Heavy Troopers encountered and subdued Morg and Terrax, capturing them as well. (Silver Surfer III#81 (fb) - BTS) - Morg and Terrax were placed in manacles that drained their power, adding it to Tyrant's stores. (Silver Surfer III#81) - Ganymede joined forces with the Silver Surfer, revealing her history with Tyrant. They followed energy trails to Tyrant's Fortress, where they were assaulted by and narrowly managed to overpower some of Tyrant's Heavy Troopers. However, they were both easily defeated by Tyrant himself, who added them to his manacles. Tyrant confronted his prisoners, revealing how they would be used to power his Troopers and his Fortress while carved a new empire for himself. Meanwhile, Galactus decided to follow the trail to his missing herald, Morg. (Silver Surfer III#82) - Tyrant's Heavy Troopers encountered and subdued Jack of Hearts. (Silver Surfer III#82) - As Tyrant taunted his prisoners with his plans, his Troopers brought in their newest prisoner, Jack of Hearts. Jack assaulted Tyrant, but he quickly saw that he could never hope to challenge Tyrant's power; Jack instead unleashed his full power, normally held in check by his suit, causing a devastating explosion which harmed Tyrant not in the least, but did destroy the manacles holding his prisoners. Joined by his Troopers, Tyrant fought off his attackers, dropping even the powerful Silver Surfer, leaving none to stand against him. None, that is, except Galactus, who arrived at last, seeking Morg. Though Tyrant was hungry for vengeance after his previous defeat, he recognized that a battle between them at that time would not benefit either of them. Tyrant agreed to withdraw if he could leave unmolested and retain one captive as a source of power. 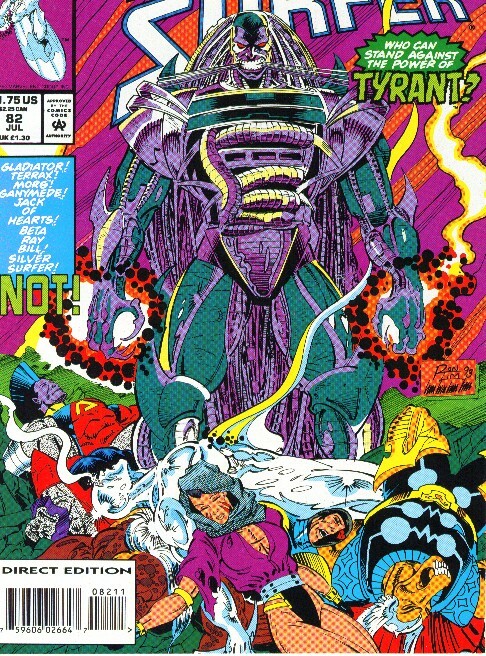 Galactus agreed, as long as it were not Morg, but Tyrant insisted that he be allowed to retain Morg, even when Galactus threatened war between them. Ultimately, it was mighty Galactus who backed down, allowing Tyrant to depart with Morg, maintaining the balance of power between them. (Cosmic Powers#3, 4) - Plotting to battle Tyrant, Thanos joined forces with Terrax and captured Ganymede, subduing her ally, Jack of Hearts, in the process. Thanos hoped to gain her knowledge of how they might defeat Tyrant. (Cosmic Powers#5) - Tyrant taunted Morg, reviewing his origins via tapping his mind and claiming to be more powerful than his master. Meanwhile, Ganymede told Thanos that Tyrant had no weaknesses, but she agreed to join him against Tyrant. As Ganymede led Terrax, and Thanos to the Fortress, Tyrant placed a mind control creature on Morg and sent him to battle the invaders. 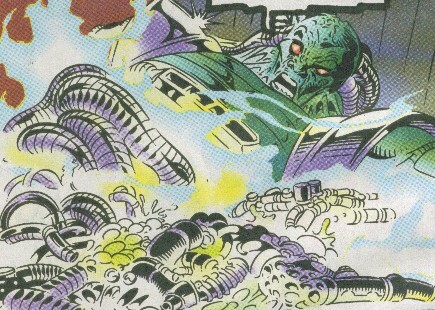 Terrax destroyed the mind-control creature, at which point Jack of Hearts and Legacy arrived to rescue Ganymede. Morg escaped, returning to Galactus's side, while Ganymede convinced Jack and Legacy to join the fight against Tyrant, who then confronted them. (Cosmic Powers#6) - While Ganymede, Jack, Legacy, and Terrax battled Tyrant, Thanos located Tyrant's computer center, learned his full origins, and stole a large power sphere from him. Though Terrax actually wounded Tyrant, he and all others fell before Tyrant's power. Thanos arrived, revealed Tyrant's origins, and challenged him, resulting in a fierce battle. Eventually feeling that he had learned and gained what he wanted and stood up to Tyrant's assaults, Thanos teleported away, feeling that he had humbled his powerful foe. However, Tyrant then entered another chamber within his Fortress, revealing an even larger power sphere. (Cosmic Powers Unlimited#3 (fb)) - Following his unpleasant encounter with Thanos, Tyrant punished the race the race he had appointed military protectors of his "worldship"; he tore the hearts out of every male and through their body husks into space. One of these frozen cadavers was found by the extradimensional entity Jakar, who found that the victim's dense physiology had retained a perfect mold of the fist that had burned its his chest cavity. From this Jakar made a casting of Tyrant's hand. (Cosmic Powers Unlimited#3) - Promising to help them vanquish Tyrant in return, Jakar sent Ganymede, Jack of Hearts, and the artificial Spinster Persephone to steal another of globe of power of power from Tyrant via the casting to access the chamber. Jack was sent to occupy the Troopers, while the Spinsters stole the globe, intending to draw the attention of Tyrant, who would revive and confront them. However, Jakar instead teleported the Spinsters and Jack back into his ship after he had acquired the globe, and then dimensionally traversed numerous galaxies to flee Tyrant's wrath. (Silver Surfer III#101) - Tyrant summoned his Toady, instructing him to locate Galactus. (Silver Surfer III#102) - The Toady reported that it had located Galactus' energy signature, after which Tyrant sent the Toady to engage Morg and schedule an audience with his master, intending to feign peace and then strike when Galactus' guard was down. (Silver Surfer III#104 - BTS) - The Toady began its mission, crossing a galaxy or two, and finally approaching Galactus' worldship. Morg detected and attacked the drone, severing one of its arms and both of its legs. (Silver Surfer III#105 - BTS) - Morg brought the Toady-drone to Galactus, who heard it out and agreed to a meeting. After sending the drone back to Tyrant, Galactus sent Morg to find a planet on which he could feed, so he would be at the height of his power when he confronted Tyrant. Meanwhile, Morg came upon the idea that he could use the Ultimate Nullifier to help Galactus against Tyrant. (Silver Surfer III#106) - Tyrant screamed in pain and rage as Galactus consumed the energies of a planet, forever robbing them from the stores from which Tyrant drew his power. Tyrant then instructed the Toady-drone to fly him to Galactus' worldship. Meanwhile, Morg coerced the Air-Walker to help him locate the Ultimate Nullifier. (Silver Surfer III#107) - When the Air-Walker attempted to refuse to help Morg, Morg trapped his essence inside a small pot, forcing him to lead him to the Nullifier if he ever wished to be restored to Galactus' computer banks. Morg's ship docked on Galactus' worldship and he met with Galactus, discussing the nature of their existence and opposition. (Silver Surfer III#108) - While Tyrant challenged Galactus to a fight to the death, Morg acquired the Ultimate Nullifier. 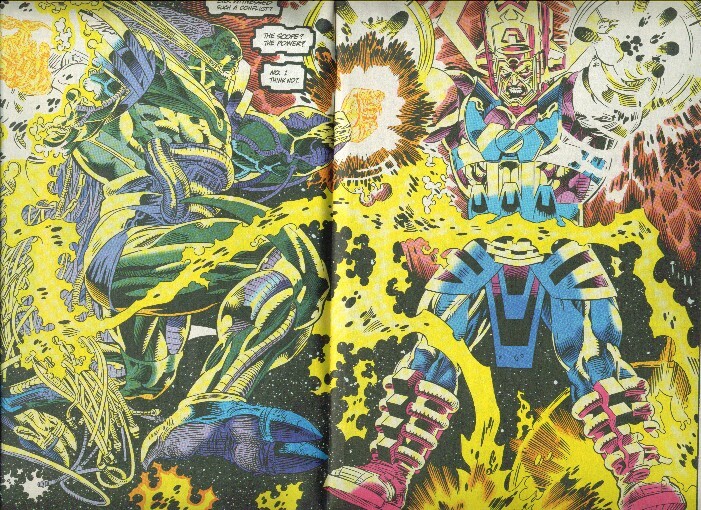 Galactus and Tyrant battled, and Tyrant revealed that he could actually absorb power from Galactus' attacks as he was powered by biospheric energy. As the struggle continued, Galactus had his ship contain Tyrant, draining his biospheric energy in an effort to slay him. 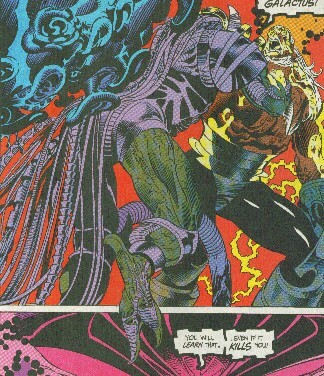 However,Tyrant's control of the energy, as well as his ability to bend other constructs to his will, proved superior, and he reversed the flow, draining Galactus' biospheric energy instead. Galactus collapsed to the ground and Tyrant began to slash away at him with his talons, but then Morg arrived with the Nullifier. (Silver Surfer III#109) - As both Galactus and Tyrant cautioned Morg about the dangers of the Nullifier, the Toady-drone jumped Morg, attempting to access the power of the Ultimate Nullifier by bonding to Morg and then traveling down his arm and bonding to the Nullifier as well. However, Morg's mind proved more powerful than the Toady-drone's, and he took control of the drone's circuitry, completing the focusing device around the Nullifier, effectively transforming it into a gun. Morg blasted Tyrant with the Nullifier-weapon, disintegrating his legs. Galactus feared the energies being unleashed by the weapon, yet proved unable to dismantle the weapon in his weakened state. When the Silver Surfer arrived on the scene, Galactus directed him to stop Morg. The Surfer's attack arrived in time to save Morg from a second, lethal blast from the weapon, but the weapon, as anticipated, began to overload. Galactus sent the Surfer away before the Nullifier could explode, and Morg cut off his own arm and then fled in an effort to escape it, but apparently only the Surfer made it out in time. Galactus, his worldship, Morg, Tyrant, the Toady-drone, and the Air-Walker all vanished in the ensuing explosion. (Cosmic Powers Unlimited#3/2) - Jakar continued to manipulate Ganymede and Persephone on a wild goose chase after Tyrant, which was actually meant to enable Jakar to fully access the power of the Globe. 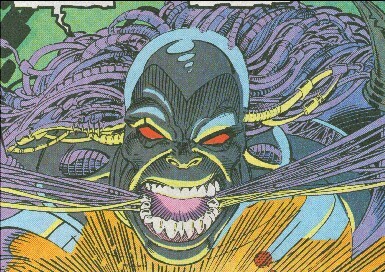 However, Jakar was confronted and overpowered by Jack of Hearts and the Silver Surfer, who destroyed the globe. Comments: Created by Ron Marz, Ron Lim, and Tom Christopher. Galactus is back...so perhaps Tyrant could have survived, too? Maybe it will take him another few billion years to recharge his power. Tyrant has an entry in OHotMU 2006 A-Z#11.